Leading cloud-centric IT organizations are establishing core capabilities to improve productivity, control costs, and provide a highly responsive end-user experience. 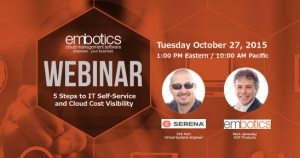 This 1 hour webinar features an in-depth case study of Serena Software and their implementation of best practices and leading technology to enhance their capabilities related to ITaaS and IT Cost Visibility. This is a no fluff event -- you'll need to have some IT chops to follow along with these guys.